To perform a lunge, you step forward from a standing position with one leg, bending both knees so that the trailing knee lines up under your hip, and then push back to return to the starting position. Lunges work many muscles of the hips and knees, including the hamstrings, a group of three muscles on the back of the thigh. The hamstrings are a group of three muscles located on the back, or posterior, thigh. All three originate from the ischial tuberosity, the sit bone, and insert onto the lower leg. Two lie on the inner, or medial, side of the posterior thigh: the semitendinosus and the semimembranosus. One, the biceps femoris, is located on the outer, or lateral, side. Collectively, the hamstrings extend the hip joint and flex the knee joint. The semimembranosus inserts onto the medial condyle of the tibia, the large shin bone. The long tendon of the semitendinosus inserts onto the upper medial tibia. The biceps femoris has two heads. The long head originates at the ischial tuberosity along with the other hamstrings, and the short head originates on the back of the femur. Both share a common insertion at the head of the fibula, the long thin bone on the lateral lower leg. Lunges work the hamstring muscles when you step forward and backward. 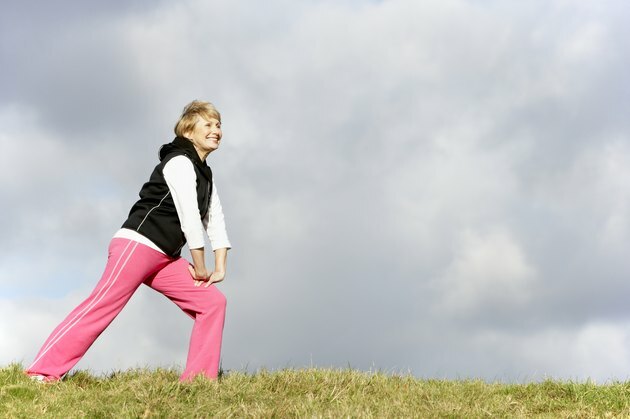 When stepping forward, the front hip and knee flex as your weight is transferred onto that leg. The hamstrings work to resist the downward pull of gravity, known as an eccentric contraction. They also help stabilize the knee. As you step back to standing, the hamstrings work to extend the hip against gravity, called a concentric contraction. There are many ways to modify the lunge. You can add weight with a barbell or dumbbells. There are also variations that incorporate twists or overhead presses while holding a medicine ball or other weight. In the walking lunge, after stepping forward into a lunge, you bring the rear leg forward to stand rather than back, and then step forward again. All of these variations work the hamstrings similarly to the basic lunge. Side lunges, in which you step laterally rather than forward, work the hamstrings secondarily. Reverse lunges work the glutes and hamstrings.